It’s been an eventful start here at Noodle Arm Disc Golf. Some of you may have noticed that the logo for this young endeavor has disappeared. My beloved Flingin’ Friar, as I affectionately dubbed him, is no more. This change didn’t come without careful consideration, and there is a story behind it that I’d like to share. Upon launching the site, I did my due diligence to start promoting it. I shared it in various locales on Facebook, and I also launched a discussion thread about it over on the forums at Disc Golf Course Review. The response was fantastic, with many people sharing the site with others and the corresponding Facebook page garnering more than 150 likes in less than a day. Needless to say, I was pleased with how this little project was taking off. Still, with any new enterprise there are going to be a few detractors, and Noodle Arm Disc Golf was no exception. On the second day of the site’s existence, some spirited discussion ensued over at Disc Golf Course Review when a couple users took issue with the Noodle Arm Disc Golf logo being a play on the old school San Diego Padres insignia. Indeed, the local team was the inspiration for the design – I mean, who looks like he would be a noodle arm more than the Swinging Friar? – and I made no contentions otherwise. However, some forum users felt I was running afoul of intellectual property laws, while others simply thought I should use a logo that was entirely original to create a name for myself. All of these users had valid points, to be sure. However, given my proximity to San Diego and my affinity for baseball (full disclosure, I’m actually a San Francisco Giants fan), I thought the logo was a fun, lighthearted accompaniment to the new site. Plus, there is plenty of precedent for a logo like this to be protected as a parody under fair use exemption laws, especially since I am not selling anything. I’m writing about disc golf, plain and simple. 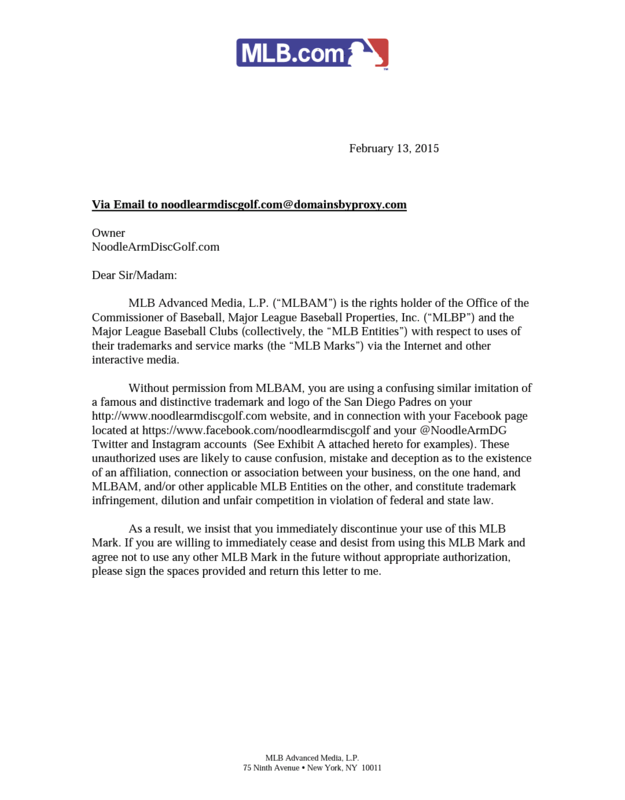 So, imagine my surprise when I opened up my email the next morning – the third day of Noodle Arm Disc Golf’s life – to find a cease and desist letter from MLB Advanced Media. MLBAM was concerned Noodle Arm Disc Golf might serve as “unfair competition” to the San Diego Padres. MLBAM, according to the letter, “is the rights holder of the Office of the Commissioner of Baseball, Major League Baseball Properties, Inc. and the Major League Baseball Clubs with respect to uses of their trademarks and service marks via the internet and other interactive media.” Basically, this arm of the MLB machine plays watchdog to make sure people have permission to use its logos. I didn’t have permission, so Major League Baseball was asking me to take the logo down. I was given seven days to reply to the letter, which would serve as my agreement to send the Noodle Arm Disc Golf logo to the proverbial cloud. Except I wasn’t going to sign the letter. I was ready to dig in my heels, content knowing that not only am I not profiting from this site, but that a disc golf blog run by a suburban dad certainly did not threaten to take any business from the Padres. These two key points – as well as being buoyed by the confidence of my tremendous graphic designer, who stood by the logo as a work of parody – I felt gave me enough shelter under the fair use exemption from trademark laws that I decided to keep the logo mostly intact. There was another chapter to the story yet to be written, though. Later that night, I received a message from a local disc golfer who also had problems with the logo. You see, apparently there is an underground sort of disc golf group in these parts (I call it underground because the group has no website, PDGA affiliation, or any social media presence) that also uses the friar for its bag tags. I know, I know. The plot thickens. 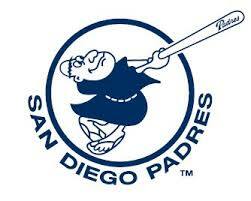 Disregarding the fact that this group had also been inspired by the Padres, I was accused of “poaching” their design. It was like Panda Express calling up P.F. Chang’s and asking them not to make food anymore, even though they both co-opted their fare from, you know, China. This club’s representative wanted me to stop using the friar and offered to make me a new logo. I politely declined, pointing out that it was all a big coincidence because we were in the same region. (Indeed, I had never heard of this club beforehand, so this wasn’t some kind of scandalous logo pilfering. And – as they soon made abundantly clear – they hadn’t heard of me, either.) Plus, I had already paid to have the logo created. I was invested financially, and that alone was enough for me to say no. The beloved San Diego Swinging Friar, the inspiration for a disc golf website logo and, apparently, controversy. Still, I contended that, since we were not competitors – I am not running a disc golf club, and the club is not writing about disc golf – we could coexist as disc golfers, both hoping to represent the sport in a positive fashion. Unfortunately, this group’s representative did not like my answer and became hostile, claiming that I had no credibility, that no one locally knew who I was, and as a result I wouldn’t make an impact with my website on a larger scale. By refusing to change my logo he said I was – and this is paraphrased, of course – spitting on those who came before me. They must have Dave Dunipace, Ken Climo, and the ghost of “Steady” Ed Headrick in their club, right? If the MLB email had my heels dug in, by this point I was up to my knees. I had no interest in being bullied over a logo, especially from people who, for all intents and purposes, should be on the same team and had no more legal claim to the design than I did. I was ready to move ahead and keep letting the friar toss that Frisbee. It had become about more than trademarks or who had it first. It was about principle. As the night wore on, though, I was left with a bad taste in my mouth. Sure, every project has growing pains, but this confluence of events in a single day felt different. The friar had to go. Not to appease Major League Baseball, or a group of disc golfers who can’t see a fellow disc golfer without seeing an enemy. But for me. I started Noodle Arm Disc Golf with the intent of writing about disc golf for fun, and the friar – indirectly – was taking that away. Haggling with mega corporations and adversarial locals wasn’t part of the plan. So, it’s time to start fresh. Until the aforementioned tremendous graphic designer cooks up another tasty morsel of logo goodness, it’ll be some header text and some pretty disc golf photos. Simplicity. Because really, that’s what this is supposed to be all about. We’re just throwing Frisbees in the park, not ending hunger. It doesn’t have to be this serious. And from here on out, it won’t be. Not here, at least. R.I.P., Flingin’ Friar. You’ll be missed. Does MLB know about the underground club using their logo?